Angry Birds Stella is the ninth game for Android phones and tablets from the series of one of the most popular arcade games in the world – Angry Birds. In it, you expect new characters and locations. The main character becomes a bird named Stella, who, along with her friends, go in search of a treasure map, as well as a photo album that she stole. 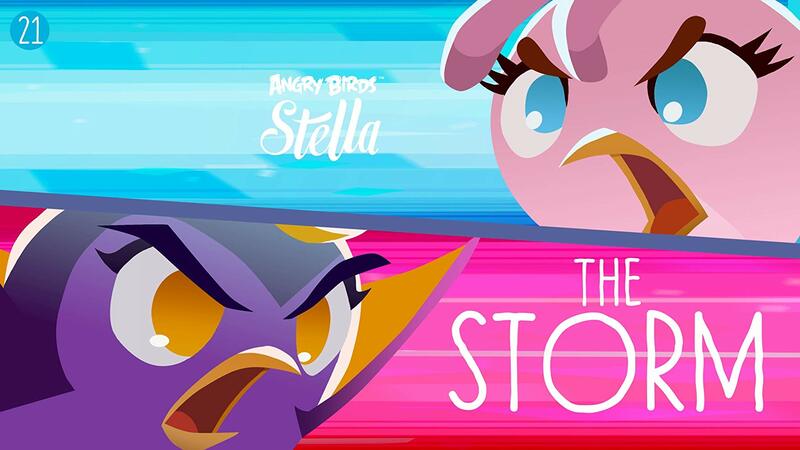 In Angry Birds Stella there are no episodes, but the game is divided into cycles and locations. Only two cycles. Pink location. Contains 11 levels and is the easiest, so that you can easily learn the basics of the game. Of the available birds, only Stella is given. The yellow location also consists of 11 levels. The level of complexity becomes a little higher. A new character is available – Poppy. Blue location. Medium, consisting of 11 levels. Brings you a new hero – Luke. Orange location. The number of levels has increased to 13. The new character is Dahlia. A huge golden flower. The final level of the first cycle. After passing it you will open the bird – Gail. The second cycle consists of only 2 locations. But do not look at the amount, not so simple. Military actions of birds take place on the beach, at sunset. The location of the shells is the largest. It contains as many as 60 levels. There are new elements in the form of: different levers, pumping systems, microphones and so on. The huge shell is the final location in the second cycle. As already happened in all past games, Angry Birds Stella has coins to which you buy characters. This time there are no super characters, they were replaced by a mighty sledgehammer that destroys the pigs’ buildings. Now the stars that you earn when passing levels, are of great value. A certain number of accumulated stars you can exchange for coins or photos of characters for a photo album. With the help of photos, you can change the appearance of birds. Stella is a standard hero who does not have super abilities, the action is quite simple, flying to one point, it repels from the blocks. Poppy – sinking down, creates a tornado. Luke – created specifically against glass blocks, issuing a sound wave. Dahlia – has the ability to teleport to the point you specified. Gail – destroys the blocks that you paint. Willow – a crushing spinning swirl. In Angry Birds, Stella, the mechanics of the game changed slightly. Each attack should be thought through carefully. The shot is already inadequate by direct aiming, it is necessary to change the trajectory of the flight, taking into account the ricochet. Step 4. Now type Angry Birds Stella in the search bar. After the search, click “Install” to continue and finish.